This aint AutoCAD, but it is something that people at school ask about a lot and it is a really needed task that is missing from REVIT. So bare with me as I show you this work-around. This method of making PDFs of your Revit model requires Power Point. With your Revit model open, open the “application menu” (the big purple R). In the picture below, the dialog box on the right will appear first. Change the “Fit to” (pixels box) to something above 700. I chose 1080 randomly. 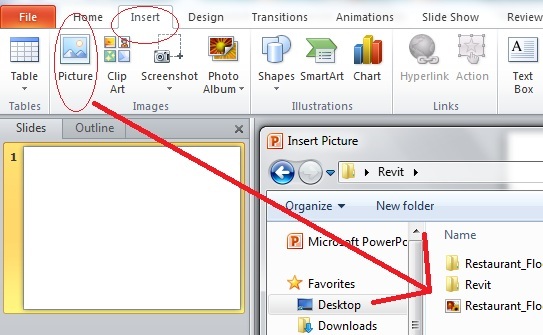 If you have multiple sheets that you would like to turn be in your PDF click the “Select…” button. This will bring up the dialog box on the right as shown above. Select the sheets that you want to export. There should be a check next to the name that you select. Click OK when finished selecting sheets. At the top of the Export Image dialog, The top area called “Output” is where you choose where the pictures will be exported to. Simply click the “change” button and navigate to where you would like these images to be stored. Now click OK at the bottom of the dialog box and let Revit export these images. Since these are high quality images, it may take several minutes. After the images are made, open the images and verify that they are good enough quality by zooming into them. If you can zoom in to them and they are not pixilated, they will be fine for this process. Now we need to set up the Power Point for our project. In the left column of “slide previews” there should be one slide. Enter the size of paper you would like the print to beI entered: 36 = width and 24 = height for an ARCH D print. Set the Actual paper size for plotting (don’t use 8.5″X11″as your page setup unless that is the desired plot size). If you have created more than one Image to be made into a PDF, you need to add one picture per slide. Now navigate to the picture that you want to add to that slide. Repeat this process to add the images to the slides. If the slides get out of order, simply drag them into position in the slide preview area. Once you have the images inserted and the desired order of the slides, we can now make our PDF. Choose PDF from the list. Choose the destination where you want the PDF to be saved. This entry was posted in Revit, TIPS. Bookmark the permalink.